Abstract: The most recent wave of violence in the Central African Republic (CAR) began sweeping across the country in 2012. It started when the Séléka, an alliance of rebel groups operating in the north-east of the country, set off for the capital Bangui. They ousted President François Bozizé in March 2013 and installed their leader, Michel Djotodia, as president. The violence of the Séléka provoked the emergence of a loose coalition of local defence groups, the Anti-balaka. Violence between and among the groups forced Djotodia to step down in January 2014, and a weak transitional government was installed. However, conflict between numerous armed groups continues, and tensions within communities remain unresolved to this day. 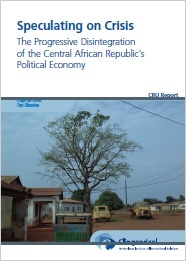 The report argues that four interlinking factors shape the CAR's volatile present: 1) a fractured society; 2) caused by chronic political and armed crises; 3) strongly shaped by external influences on domestic politics and rebellions; and 4) a lack of geopolitical interest in the landlocked and sparsely-populated country. In examining these factors, the report analyses how self-interested political elites have exacerbated deep historic divisions and stimulated the proliferation of armed groups. External interferences - both formal and informal - in the country's political economy and security have played part in the violent struggle. The relatively limited international aid and stabilisation efforts in the CAR have been unable to change things for the better. The report shows that current and future international interventions must make strategic and coordinated choices to create stability: Short-term military agendas should be supplanted by long-term civil empowerment, the peripheries deserve more attention, crimes need to be persecuted at the same time as communities need to be reconciled, and regional interests need to be redirected to promote internal stability.